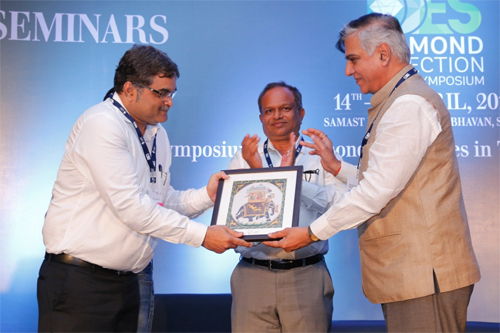 Gem & Jewellery Export Promotion Council (GJEPC), the apex body of India’s gem & jewellery industry, organized the second edition of ‘Diamond Detection Expo & Symposium (DDES 2017)’ on 14th & 15th April 2017 at Samast Patidar Samaj Bhavan in Surat. 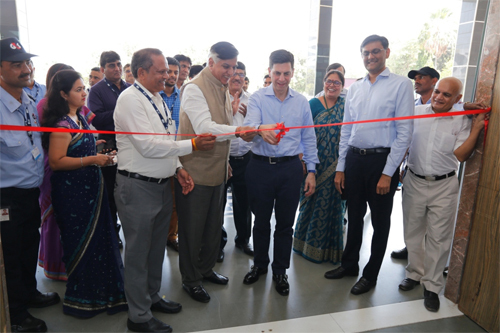 This ‘one of its kind’ unique expo in the world’s largest diamond manufacturing centre had all leading gemmological laboratories participating under one roof showcasing different types of machinery, equipment & technologies available to identify synthetic diamonds. 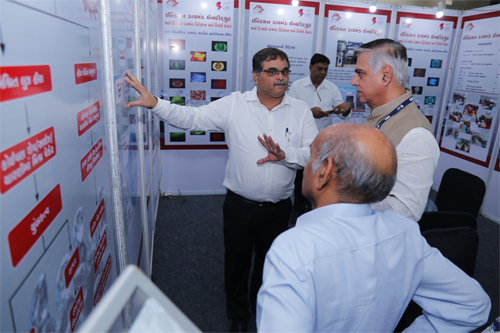 The 2-day event was jointly organized by GJEPC under the auspices of the Natural Diamond Monitoring Committee (NDMC). 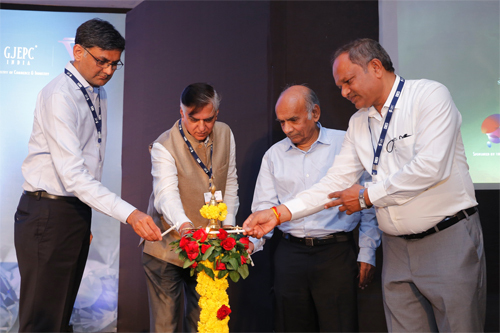 Mr. Praveenshankar Pandya (Chairman, GJEPC) and Mr. Tom Moses (Executive Vice President and Chief Laboratory and Research Officer, GIA) inaugurated DDES 2017 in the presence of Mr. Dinesh Navadiya (Chairman, Surat Diamond Association and Gujarat’s Regional Chairman, GJEPC), Mr. Ashish Mehta (Convener, NDMC, GJEPC), Ms. Nirupa Bhatt (Managing Director, Gemological Institute of America, India & Middle East) and Mr. Sevantilal Premchand Shah (Founder Partner, Venus Jewel). Several prominent personalities from the diamond, gems and jewellery business from Surat were present on the occasion. During the inaugural session, Mr. Dinesh Navadiya (Chairman, Surat Diamond Association and Gujarat’s Regional Chairman, GJEPC) and several members of the trade took a solemn pledge that they will preserve the reputation of Surat and refrain from indulging in any malpractices. In fact, Mr. Pandya announced a special 50% discount for all associations in Surat and nearby areas, which wanted to install diamond detection machines. In the presence of Mr. Praveenshankar Pandya (Chairman, GJEPC), Mr. Dinesh Navadiya (Chairman, Surat Diamond Association and Gujaratâ€™s Regional Chairman, GJEPC) and several members of the trade took a pledge at DDES 2017 that they will preserve the reputation of Surat and refrain from indulging in any malpractices. Ms. Parul Merchant from Bonas & Co. Diamond Brokers & Consultants presented key findings of Part 1&2 of a four part study on the synthetic diamonds landscape, covering the value chain, key players, types of production and machines used. She also touched upon the synthetic diamond retail landscape, output capacities, etc. Based on her study, maximum possible production based on installed machinery (not taking into account breakages, downtime, failure), synthetic diamonds account for 2.3mn to 4.2 mn - ~2-3% of the total natural diamond production volume of 127.4 mn. She said that it is easy to identify rough synthetic diamonds - CVD process yields a unique tubular output, which mostly has a brownish tinge whereas synthetic diamonds through HPHT are cubo-octahedral and fancy yellow. The US is a significant market for retailing synthetic diamonds while India, China & Singapore are production hubs. There is some commercial output from Russia (bigger pieces). There are some producers in Europe, but they are mostly in R&D phase. There have been instances of larger sized synthetic diamonds with 10.2 kt VS1 and 5.2 kt VS1 fancy deep blue. FTC and ISO have created guidelines to regulate the business. Trade is confused and looking for direction wrt synthetic diamonds and needs a lot of counseling and support. 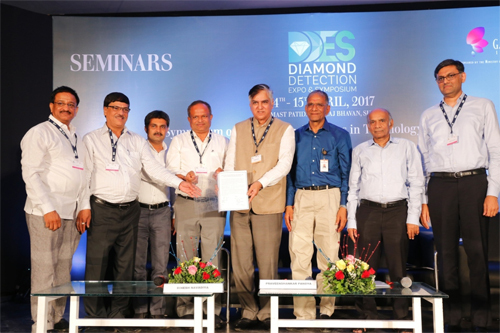 DDES 2017 created an opportunity for companies providing synthetic diamond detection machines & equipment along with leading laboratories and service providers to interact with trade members to impart knowledge on various techniques to detect synthetic diamonds. Exhibitors include Gemmological Institute of America (GIA), Gemmological Institute of India (GII), Gemological Science International, Indian Diamond Institute, International Gemological Institute, DRC Techno, HRDAntwerp and IIDGR amongst others. The equipment included AMS machines, Diamond Check, Diamond Serve, Spotter, PTIR Spectroscopy, etc. The 2 day event included proficient talks and panel discussions with renowned experts from the trade covering important topics. The panel discussions included: 14th April 2017 - Impact on synthetics on diamond industry and on Surat Participants included Mr. Praveenshankar Pandya, Mr. Ashish Mehta, Mr. Dineshbhai Navadiya and Mr. Keval Virani (KARP Impex) moderated by Samir Joshi (ED, Indian Diamond Institute)]. Mr. Keval Virani said that customer has zero tolerance for lack of information about synthetic diamonds at point of sale. However, a lot of work has to be done in terms of sample sizes and additional cost to be borne by the trade for detection, disclosures and documentation. Technical session moderated by Mr. Janak Mistry (Lexus), Mr. Wuyi Wang (GIA), Mr. Amitabha Das (IIDGR), Mr. Rajiv Sahasrabudhe (IIDGR) and Mr. Tehmasp Printer (IGI). On 15th April 2017 - Introduction of ams2 to the Indian market, why there is a need of 100% screening of goods - by IIDGR. 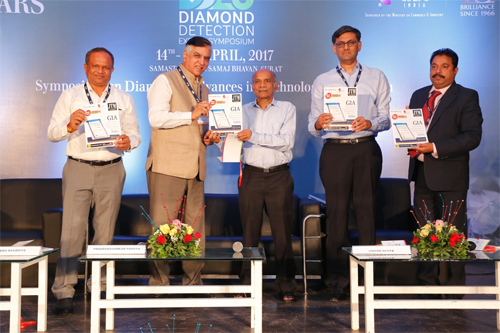 Mr. Dinesh Navadiya, Mr. Praveenshankar Pandya, Mr. Sevantilal Premchand Shah, Mr. Ashish Mehta and Ricky Rebeiro from Jewellery Technology & Machinery (JTM), New Jeweller Group, unveiled the special report on DDES 2017. 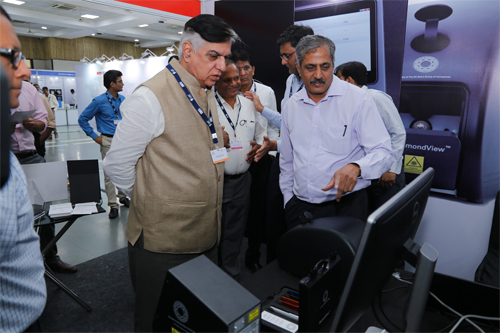 One of the key recommendations of the recent NDMC study was improving detection technology for the industry. 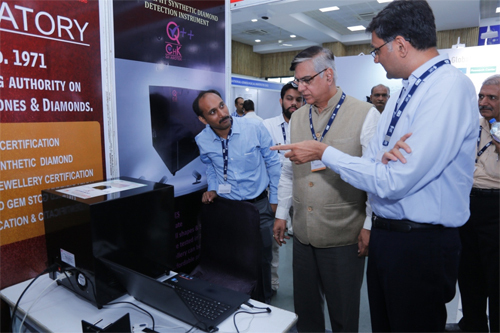 It is imperative for the gem & jewellery industry to keep abreast about the knowledge & information on synthetic diamonds, its detection through various technologies available, based on which objective, GJEPC in association with Bharat Diamond Bourse (BDB) had organized Diamond Detection Expo & Symposium (DDES 2015) from 15th – 16th Dec 2015 in Mumbai. In the recent past, there has been increase in production of gem quality synthetic stones. There has also been rise in cases of instances faced by buyers finding that the diamonds they had purchased as believing to be Natural Diamonds were actually discovered later to be Synthetic Diamonds. In light of the seriousness of such allegations, the GJEPC saw it as a critical responsibility to study the issue of undisclosed mixing in more detail and then outline any actions that may be required to address it. The main objectives are driving segregation technology innovation and adoption; driving innovation by ensuring coordination among research bodies; coordinating with device manufacturers to increase scale of production; and driving towards lower acquisition costs by enabling scale and ensuring wide participation of players.